Paper Notes 1: Jiafeng Guo, Gu Xu, Hang Li, Xueqi Cheng. A Unified and Discriminative Model for Query Refinement. In Proceedings of the 31st Annual International ACM SIGIR Conference (SIGIR’08), 379-386, 2008. Query refinement typically includes a number of tasks such as spelling error correction, word splitting, word merging, phrase segmentation, word stemming, and acronym expansion. (查询优化主要包括了这些任务) This paper proposes employing a unified and discriminative model for query refinement. Specifically, it proposes a Conditional Random Field (CRF) model suit-able for the problem, referred to as Conditional Random Field for Query Refinement (CRF-QR)refinement tasks can be performed simultaneously (此方法最大的优点)and thus the accuracy of refinement can be enhanced. Li et al. proposed a method for spelling error correction by using a Maximum Entropy (ME) model as well as the Source Channel model. They utilized distributional similarities between the query word and its correction candidate as features in the ME model. Cucerzan and Brill addressed a more generalized spelling correction task using a Source Channel model(源信道模型) and query log data. They made use of bigrams as the source model and Weighted Edit Distance as the channel model. However, it is less possible to extend their approach to handle other alteration types, e.g. phrase segmentation. Peng et al. proposed a method for conducting stemming on head words of queries. They employed a Statistical Language model in stemming candidate selection. Risvik et al. proposed a method for phrase segmentation using the so-called “connexity measures“. A “segmentation score” is computed from connexity values and used as a criterion for segmentation. Query refinement is a problem as follows. Given an ill-formed query from the user, we refine the query and help the user to better retrieve documents. A number of refinement tasks are involved: spelling error correction, word splitting, word merging, phrase segmentation, word stemming, and acronym expansion. (多任务整合到一起的必要性). Refinement tasks are often mutually dependent. In the above example, stemming on “learn” needs help from spelling error correction on ”machin”, and vice versa. Furthermore, phrase segmentation on “machine learning” depends on the stemming and the spelling error correction, and vice versa. Therefore, it is better to employ a unified framework with which we perform all the refinement tasks simultaneously. In this way, we are able to significantly boost the accuracy of query refinement. We propose employing a unified and discriminative model in query refinement, specifically the CRF-QR model. There are two types of models: a basic model and an extended model. For ease of explanation, we explain the former model first. In our experiments we used the latter model. For the task of spelling error correction, for example, we can consider the following refinement operations: deletion, insertion, substitution, and transposition. For word stemming, we can introduce operations such as +s, +ed, and +ing. 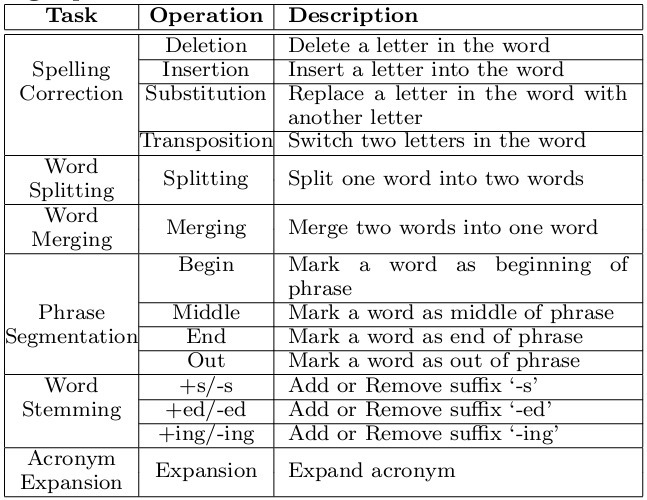 Similarly, we can define operations for other refinement tasks, as de-scribed in Table. CRF-QR is actually a graphical model, in which vertexes represent refined query words, edges dependencies, and conditional vertexes input query words. If we assume that only one refinement task can be applied to a query word, then we may directly employ the basic CRF-QR model. In the extended model, we use multiple sequences of operations as well as their corresponding sequences of intermediate results. In this way, we keep the number of parameters the same as that in the basic CRF-QR model. In our experiments we made use of a real data set consisting of 10,000 queries. The queries were randomly selected from the query log of a commercial web search engine. The average length of queries is 2.8 words. Among the 10,000 queries, 6,421 queries are refined. Note that the majority of the refinements are phrase segmentation. Furthermore, there are 649 queries with multiple refinements. The labeled data were further divided into a training set containing 7,000 queries and a test set containing 3,000 queries. it could not correctly refine the query “nypark hitel” to “ny park hotel”‘. Specifically, it could not simultaneously change “hitel” to “hotel” and change “nypark” to “ny park”, because one operation needed to leverage the result of the other.